What’s Your Favorite Make Modification? What is the favorite mod that you have done to your ride? What is the one mod that you wish you currently had? We all are not lucky enough to race faster than the posted speed limits in our souped up hot rods. Rather than sit around depressed we are not famous NASCAR or F1 drivers, install quality parts into your street machine and show the asphalt who’s boss. One of the easiest changes you can make to your stock ride is adding a performance muffler from Magnaflow. Magnaflow has been the leading manufacturer of exhaust components for over 20 years, and their mufflers are developed and designed to pass quality and performance evaluations. Your racing venue, also known as your neighborhood, may have some noise laws—keep your speedracer’s tone within an acceptable decibel without sacrificing power. The flow-through design of Magnaflow’s Steel Race Series Mufflers puts the extra punch at the pedal. And, they are available in multiple inlet/outlet sizes. Plus, these mufflers don’t lack in the style department. They come in oval or round designs, stamped with the Magnaflow logo. They are crafted with smooth welds and polished for an endless shine. And, if their quality and looks don’t sell you, the Lifetime Magnaflow Warranty does. Not quite ready to make the plunge for the Magnaflow 14151? Is that 5″ x 8″ Oval Race Muffler with the 3.5″ Inlet/Outlet, 14″ Body Length just not calling your name? 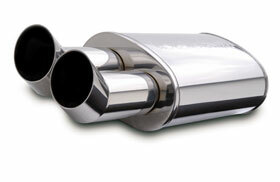 Try one of Magnaflow’s universal stainless steel round mufflers: Magnaflow 14616 or Magnaflow 14619.. When your car hits the road, make sure Magnaflow’s on your side. With the help of Street Series Magnaflow Mufflers, your ride goes from driving in to commanding the asphalt jungle. The Street Series mufflers are designed for more power on your import engine. Plus, Magnaflow ensures these mufflers are restriction free for wide open power that results in a premium tone without domineering noise. Ditch the chrome tips! Magnaflow’s muffler are crafted from stainless steel which lasts up to 5 times longer than those cheap tips from the local auto shop. Plus, these Magnaflow mufflers boast extreme polishing thanks to premium 400 series stainless steel construction and intense polishing from the inlet to the tips that puts other mufflers to shame. Plus, you can choose your tip option for the wide assortment of Magnaflow mufflers for a totally custom setup. Interested in getting that deeper rumblin’ tone with a double tip setup? You’ve got a few options. The Magnaflow 14801 boasts a 2.5” Round DTM, or you could stick with the 2.5” inches but make it square with the Magnaflow 14802 2.5” Square DTM. When you need something a little bigger, check out the 3” double tips: 3” Round DTM (Magnaflow 14803) or 3” Square DTM (Magnaflow 14804). Plus, each Magnaflow Street Series Mufflers is backed by a Lifetime Warranty! Want your daily driver to rev with a more dignified tone? Does your rickety old truck need to be silenced? Need more power so you feel like you’re on the track next to Dale Earnhardt Jr.? If you do, these aftermarket exhaust pipes are worth checking out! 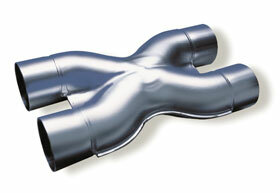 Plus, they are manufactured by one of the industry’s most well-known brands—Magnaflow. It’s only a guess, but we’re willing to bet that your daily driver is driven like a race car—of course only when the kids aren’t in it. But, your safety is important too, no matter what your spouse says in their fit of anger over how many performance parts you just bought for your speedy ride. 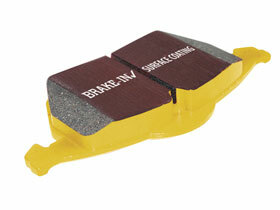 And, to make sure you’re race-car-ready, be sure to install EBC’s Yellow Stuff Brake Pads. Remember, just like what goes up must come down…what speeds up must slow down. Slow your race car down safely with these direct replacement brake pads. Who Will It Be? Michelin or Pirelli? With Bridgestone’s decision to leave Formula 1, they are still in need of a tyre supplier for the 2011 season. The two main contenders are Michelin and Pirelli. Both have previously been in F1, 2006 was Michelin’s last year and Pirelli in 1990. In Monte Carlo on Sunday May 16th, The Formula One Teams Association met in hopes to make a final decision, but no agreement was made. There are no indicators as to which supplier has an upperhand. Michelin has the most recent F1 experience, but Pirelli has poised a very good proposal. F1’s McLaren is bringing “affordable” F1 racing style to your driveway. 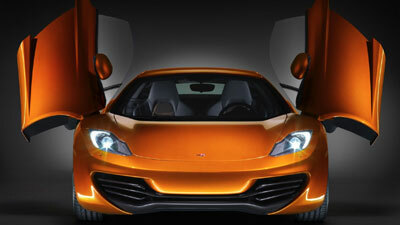 The newly unveiled MP4-12C is a high-performance sports car that fused the Formula 1 principles with the customer expectations. This supercar isn’t McLaren’s first attempt at a road car, the McLaren F1 was introduced 15 years ago, but only a rare 107 were built. This time around, this luxury sports car plans to be produced at a rate of 1,000 cars a year. This super 2-seater is anticipated to sell for £150,000. Why so ‘affordable?’ Well, the lightweight one-piece carbon-fiber chassis allows McLaren to place the price tag about half as high as it normally would be expected for a car of its nature.